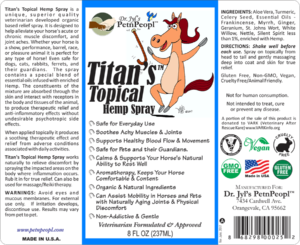 Titan’s™ Topical Hemp Spray is a unique, superior quality veterinarian developed organic based relief spray designed to help alleviate your horses chronic and acute muscle discomfort and joint aches. It is a natural solution that offers non-irritating, instant and powerful reprieve caused by muscle aches, minor sprains and strains, chronic conditions, skin irritations, backaches, hip and elbow discomfort, arthritis, joint stiffness for horses, dogs, cats, rabbits, ferrets, and other animal’s with muscle and joint aches. It contains a special blend of essential oils, infused with enriched Hemp. The constituents of the mixture are absorbed through the skin and interact with cannabinoid receptors in the body and tissues of the animal Titan’s 8oz With Hemp Label, to produce therapeutic relief and anti-inflammatory effects without undesirable psychotropic side effects. When applied topically it produces a soothing therapeutic effect and relief from adverse conditions associated with daily activities. The main physiological function of the cutaneous Endocannabinoid system (ECS) is to support the health of the skin through modulating, differentiation, proliferation and immune competence of the cells of the dermis and epidermis. Topical products containing phytocannabinoids will help maintain normal dermal homeostasis by balancing the skins Endocannabinoid system. Titan’s Topical Hemp Spray works naturally to relieve discomfort by spraying the impacted areas on the body where inflammation occurs. Rub it in for true relief. Can also be used for massage/Reiki therapy. WARNINGS: Avoid eyes and mucous membranes. For external use only. If irritation develops, discontinue use. Results may vary from pet to pet.